Well, it wasn’t my first haircut, but my daughter’s! 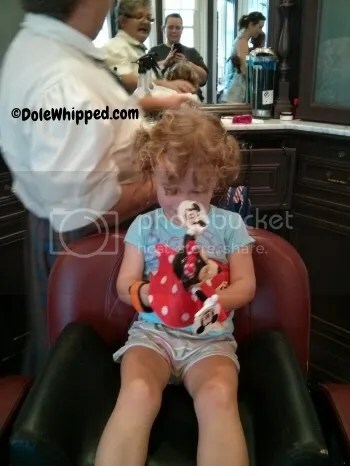 Last October, when my youngest was just a wee babe of two years old, I thought it would be a fun experience to have her first haircut at Walt Disney World. It was a great decision and I’m so glad we did it! You will need an appointment and when you or your travel agent sets it up you will have to request the First Haircut package. For $19, you get the haircut and a style, a certificate, and a Mickey ear hat with My First Haircut embroidered on the back. I think this is one of the most overlooked bargains in all of Disney. 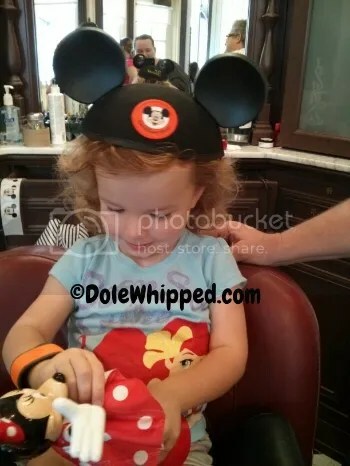 The ear hats alone start at around $15, so this is a great value, especially if your little one is too young for Bibbidi Bobbidi Boutique or Pirate’s League. As you can see, she was overdue for a trim. The stylist was so nice! She gave my daughter a little toy to play with (we ended up having to buy that toy later because she loved it so much!) to distract her from the haircut. We just did a little bit of a trim, nothing drastic. After the cutting was done, she got to try on her new hat! 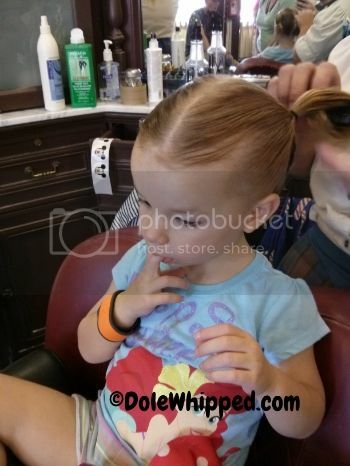 After the hat time fun was over, the stylist offered to put my daughter’s hair back into pigtails. It was hot that day and I wanted to keep her hair out of her face so I agreed that would be best. 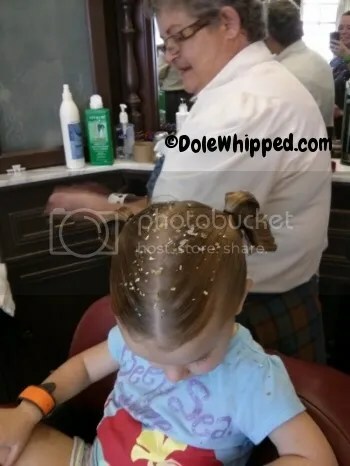 She put just a little bit of gel in to help hold the style, and it made the most adorable curly pigtails you’d ever seen. I was so pleased by that little detail. And finally, it just wouldn’t be Disney without some pixie dust! I talked to the stylists for a little while after the haircut and they were all so wonderful and nice. Most of them had been working in that tiny little shop for decades and they seemed to enjoy it so much. They were just amazing with the kids. It really was a fantastic experience and I would recommend anyone, not just the babies, have a haircut there.